In a hot dutch oven (or large pot) add the olive oil and the ground meat. Cook the meat until browned, then add the onions and garlic and cook until soft. 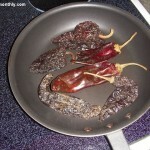 At the same time heat up a dry skillet to toast the dried peppers. Once the peppers have browned on both sides, remove the stems and seeds and add the roasted peppers and chipotles to 2 cups of very hot water. 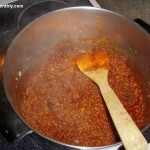 Let the peppers soak for 35 mins, then take a stick blender to blend up the pepper mixture. Now add the spice broth to the dutch oven, along with all the remaining ingredients (spices, tomatoes, beer, etc.) 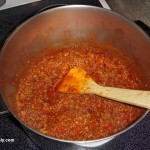 And cook the chili for at least 30 mins. This chili was TOO smoky, both the chipotle peppers in adobo and smoked paprika was over kill. Next time I’m only going to use about 1/2 the can of chipotle’s, and not add any smoked paprika to the recipe. I needed to soak the beans longer! I followed the package and soaked the dried beans overnight on the counter, and they were hard when I added them to the chili. Next time I’m giving the beans a soak for 24 hours in cool water. Next batch I’m going to use half the amount of dried peppers, since I think of went overboard with the peppers in this batch. 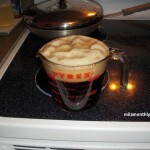 Not going to use dry stout, instead I’m going to use beef or chicken stock for the cooking liquid. 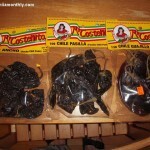 Since the stout added a strange sweet flavor to the chili. When I make a pepper broth next time, I’m going to add the chipotle’s so that they get blended with the re-hydrated peppers. 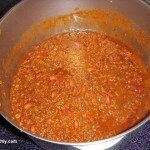 When I originally made the chili I added the chipotle’s with the spices, tomatoes, beer, etc. The chili needed some more tomatoes since 1 can wasn’t enough for the size of the batch. 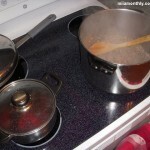 So for the next batch I’ll use a 15oz can of diced tomatoes and a 15 oz can of tomato sauce. Since I’m using chipotle’s, the pickled jalaneno’s are just overkill in the heat department. I don’t soak my beans at all before they go in. 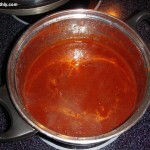 I just dump ’em and after 6 hours or so at a very low simmer, when they are tender, the chili is done. I took the seeds out of the dried peppers before I soaked them in the hot water and I just tossed the seeds and stems into the trash. Usually I wear nitrile gloves when I handle spicy foods, but for some reason I wasn’t wearing any gloves this time around. I still need to mess around with the spice mix, but thanks for the tips. Hard to believe, but yes this was too smokey. The combination of the Spanish smoked paprika and the whole 7 oz can of chipotle’s was overkill in the smoke department. is there such a thing as too smokey? Did you take the seeds out of the dried peppers after you boiled them? Put oil on your hands before you handle the peppers so you will not burn your skin. That will take the heat down. Add the heat back with the pickled jalap because they are more consistent with heat than fresh or dried. Peter’s mom has been teaching me her ways I will try to share everything I learn.